Deep in the earth, men bore through mountains and under river beds to build our tunnels. Deadly peril constantly stalks them. Here is the thrilling story of their work— one of America’s most hazardous occupations. 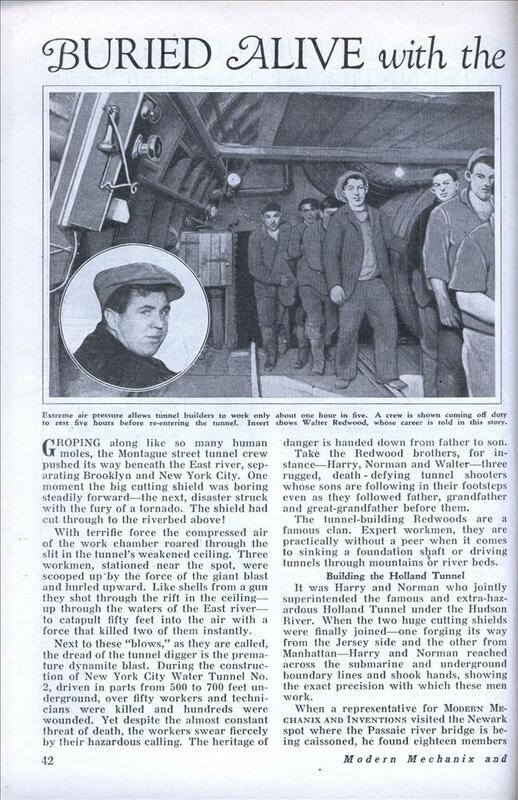 GROPING along like so many human moles, the Montague street tunnel crew pushed its way beneath the East river, separating Brooklyn and New York City. One moment the big cutting shield was boring steadily forward—the next, disaster struck with the fury of a tornado. The shield had cut through to the riverbed above! With terrific force the compressed air of the work chamber roared through the slit in the tunnel’s weakened ceiling. Three workmen, stationed near the spot, were scooped up by the force of the giant blast and hurled upward. Like shells from a gun they shot through the rift in the ceiling— up through the waters of the East river— to catapult fifty feet into the air with a force that killed two of them instantly. Next to these “blows,” as they are called, the dread of the tunnel digger is the premature dynamite blast. During the construction of New York City Water Tunnel No. 2, driven in parts from 500 to 700 feet underground, over fifty workers and technicians were killed and hundreds were wounded. Yet despite the almost constant threat of death, the workers swear fiercely by their hazardous calling. The heritage of danger is handed down from father to son. Take the Redwood brothers, for instance—Harry, Norman and Walter—three rugged, death – defying tunnel shooters whose sons are following in their footsteps even as they followed father, grandfather and great-grandfather before them. The tunnel-building Redwoods are a famous clan. Expert workmen, they are practically without a peer when it comes to sinking a foundation shaft or driving tunnels through mountains or river beds. Building the Holland Tunnel It was Harry and Norman who jointly superintended the famous and extra-hazardous Holland Tunnel under the Hudson River. When the two huge cutting shields were finally joined—one forging its way from the Jersey side and the other from Manhattan—Harry and Norman reached across the submarine and underground boundary lines and shook hands, showing the exact precision with which these men work. When a representative for Modern Mechanix and Inventions visited the Newark spot where the Passaic river bridge is being caissoned, he found eighteen members of the Redwood family working there. Walter, the youngest of the three veterans, finally revealed the history of his tunnel-digging family after considerable prompting had overcome his natural modesty. “My great-grandfather, Robert Redwood, was first of the line of tunnel borers. We originated in England, you know. Then came my grandfather, also named Robert. He worked in the well-known and historic tunnel from England to Severn, under the water to Wales. “My father, William, came by his tunnel-working inheritance quite naturally, and we have all followed suit. My mother’s father was also a tunneler, by the way, and so were her eleven brothers. Our sisters are married to sandhogs, and our sons are in the same business. Walter Redwood, who is forty-one, started his tunnel career at the age of thirteen in Birmingham, England, on a railroad bore. He was a dynamiter’s helper and got five cents an hour for his services.’ “In 1910 I came to New York City,” he says. “There was a demand for tunnel experts in those days and in the following years I worked on practically every important tunnel job in New York City and the rivers which flank it. Ninety Feet Under Water “This Newark contract is an air job, calling for work ninety feet under water. Because of the high air pressure under which we work, we put in one hour of actual work while we’re off duty the next five. We work just two hours of a twelve-hour day under a pressure of thirty-four pounds to the square inch. “This is about as perilous a job as I have ever worked on. We are working in a steel and concrete caisson, eighty by thirty feet. This caisson sinks with my crew of workers. That is, as we dig down and make room, the caisson wedges downward. Every pound of air that we put on takes 250 tons off the weight of the caisson. That is, each pound of compressed air lifts the equivalent of 250 tons weight in pushing the ‘deck’ or ‘ceiling’ of the caisson upwards. “As soon as the air is dropped two or three pounds, the caisson drops right down. That is the terrific force of its weight. On this job I am in charge of the air-lock. I operate the compressed air instruments and you can easily understand what a slip or a flaw in judgment might mean. “Bends” Affect Workers “The most common ailment from which the sandhog suffers is the ‘bends.’ This malady also affects deep-sea divers. It comes from a too sudden change in pressures. Either going from normal to under-pressure or vice versa has been too fast, and you get air-bubbles in your blood, preventing the normal flow. 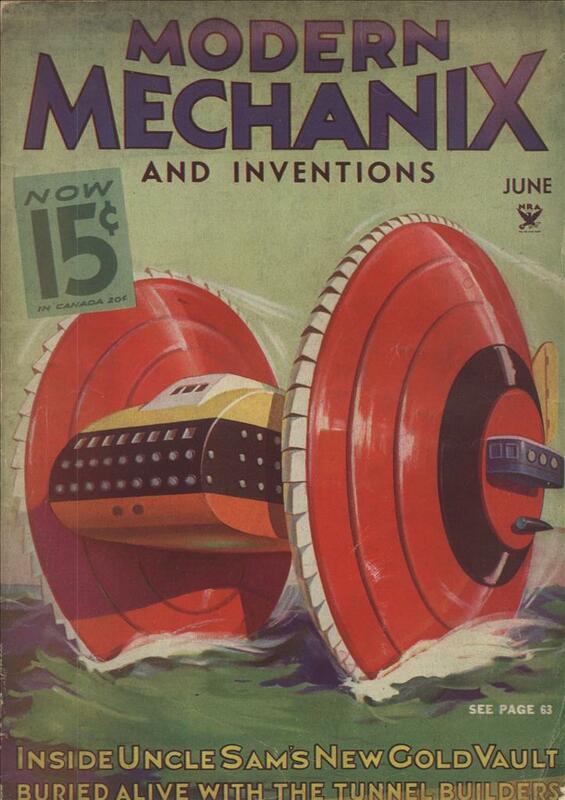 “When the sandhog reports for work, he goes down the shaft and enters the air-lock. He sits there as the lock-tender works the pressure up to a point equal to that in the tunnel. “The highest pressure he can work under is fifty pounds to the square inch. Under these conditions, he works for just half an hour, resting for the next five. After his time is up in the tunnel, the worker enters the airlock again where the pressure is reduced gradually until it is the same as that above ground. “Here is how we go about burrowing underground, and under a river at that. Deep shafts are sunk on either side of the river and elevators are built into them. “A huge circular shield of steel about twenty feet in diameter is then lowered into each shaft. Working toward each other from their opposite terminals, the shields are started forward, pushing through rock, mud and gravel under the mighty force of compressed air. A meeting-place for the two shields has been designated at a point midway under the river. “As the shield pushes its hood through the course of the proposed tunnel, the passage is filled with debris which the sandhogs tackle with pick and shovel and load onto cars which carry it back to the elevators where it is removed to the surface. The average sandhog gets $7.50 an hour, or $15 for a two-hour day. The eldest of the Redwoods, Harry, has often been paid $100 a day for his services. But although the rewards are high, the penalties are even higher. Death lurks in the underground caverns and no man knows, going down to the airlock in the morning, whether or not he will return safely again that night.